What is it? 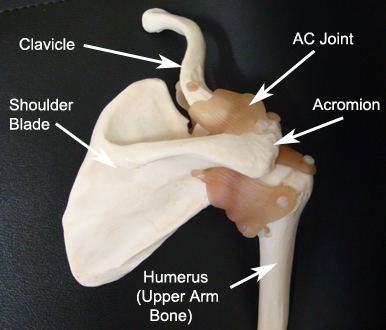 The acromioclavicular (AC) joint is where the collarbone (clavicle) connects the highest point of the shoulder blade (acromion). 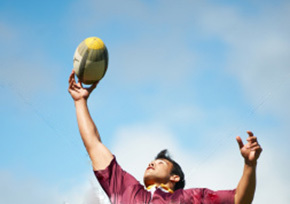 AC joint injury usually results from a fall directly onto the shoulder and is common in contact sports such as rugby. As the shoulder hits the ground the ligaments that surround and stabilise the AC joint are damaged. In less severe injuries there may only be a sprain (not tear) of the ligaments that does not lead to deformity. With increasing force, the ligaments attaching to the underside of the clavicle are torn leading to separation of the collarbone from the shoulder blade resulting in an obvious bump in the shoulder. What are the symptoms? At the time of the injury the area will be painful and shortly after bruising and swelling may develop. In the situation of a more severe injury where the ligaments have fully ruptured, there will be deformity with a “bump” on the top of the shoulder. After a few weeks the acute pain will settle and you will gradually regain motion in the shoulder. Unfortunately the ligaments do not heal and the deformity will persist. Not all patients get persisting symptoms, but those that do complain of pain and weakness that is particularly noticeable with overhead activities. Will I need any further investigations? Diagnosis is usually made on examination. 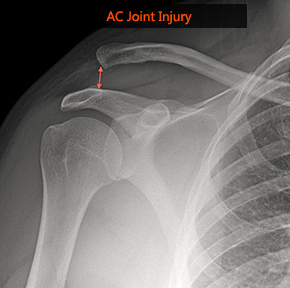 X-rays are required to show the degree of AC joint disruption and to rule out associated injuries. More detailed scans are not required. What are the non-surgical treatment options? The initial treatment of most AC joint injuries consists of pain medication, application of ice to reduce swelling and a short period of rest using a shoulder sling. Shoulder motion can safely be started as pain allows, as there is little danger of causing any further harm. With the guidance of a physiotherapist, range of motion and subsequently strengthening exercises can commence. In most cases, the pain goes away within a matter of weeks and after a few months a full recovery is made. Of those patients that have sustained a complete disruption of the ligaments, there will some that continue to get problems with pain, weakness and failure to return to their pre-injury level. Most surgeons take a “wait and see” approach although in some patients a decision is made to proceed with surgery at an early stage. What does surgery involve? Irrespective of whether surgery is performed within weeks, months or years after the injury, the principle is the same. The clavicle is realigned with the shoulder blade to restore the position of the AC joint. A variety of implants are available to maintain the connection while the ligaments heal. My preferred technique is to use a device called the Lockdown (Surgilig), which is a very strong braided polyester ligament designed to acts as a scaffold to encourage soft tissue in-growth. This is carried out through a small incision over the top of the shoulder. The artificial ligament is passed around a portion of the shoulder blade (coracoid), over the top of the clavicle and secured in place with a single screw. What is the success of surgery? Generally, this is a safe and reliable operation to improve pain and allow the shoulder to return to normal strength and function. What are the potential risks of surgery? Any surgical procedure carries risks, however every effort is made to minimise these to ensure the best possible outcome from your surgery. The main risks of the operation include infection, bleeding, nerve damage and failure of the reconstruction. It is very difficult to achieve perfect symmetry of the joint to the other side and a mild residual deformity may be present. What is the recovery after surgery? The shoulder is rested in a sling for the initial 2 weeks after surgery to allow the tissues to settle. At this point you can begin safely moving the shoulder within your comfort zone. Physiotherapy is essential after the operation, to encourage good movement, rehabilitate the muscles back to normal function and ensure you are making good progress. You will see a therapist prior to discharge from the hospital. You will be given painkillers to take home after surgery. The use of an ice pack on the shoulder may also be helpful for the first few days after surgery. You will be seen in clinic two weeks after surgery to check the wound and assess your progress. There are no sutures to be removed. The pain will gradually settle and you will regain the movement in the shoulder over the next few weeks although it can take several months before you fully recover from the surgery. When can I return to normal activities? Return to work depends on the nature of the job and your speed of recovery. You can return to desk and computer work when you feel comfortable to do so but avoid any manual work, heavy lifting or sporting activities for around 3 months. You may return to driving when you feel safe to control the vehicle, which is usually about 10-14 days after surgery. What is it? The acromio-clavicular (AC) joint is a small joint on the top of your shoulder where the clavicle (collarbone) links with the acromion (the top part of the shoulder blade). 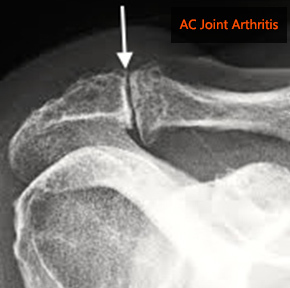 The AC joint is under constant stress as the arm is used overhead and therefore it is a common area for arthritis (wear and tear) to develop. What are the symptoms? AC joint osteoarthritis usually causes pain and tenderness at the end of directly over the AC joint over the top of the shoulder. Pain may be made worse when reaching high or across the body and can cause difficulty using the shoulder for everyday activities. Symptoms are usually insidious, without a history of discrete trauma although there may have been an injury in the past. Will I need any further investigations? Diagnosis of AC joint osteoarthritis is usually made on examination. X-rays can show narrowing of the joint and bone spurs around the joint, which are signs of degeneration. More specialist tests are not usually required if the diagnosis is clear. What are the non-surgical treatment options? Painkillers and anti-inflammatory medication may help reduce pain. Physiotherapy may help to strengthen the rotator cuff muscles and control symptoms. A steroid injection into the affected joint can help reduce inflammation and pain although the effects may only be temporary. What does surgery involve? Surgery (arthroscopic excision of the AC joint) may be necessary if other treatments fail. This is a keyhole procedure, performed under general anaesthetic usually as a day case. A local anaesthetic nerve block is usually given once you are asleep to provide pain relief after surgery. Puncture wounds are made around the shoulder to allow insertion of a camera (arthroscope). The AC joint is located and a burr is used to remove a small portion of the end of the clavicle. This leaves a gap to prevent the bone ends from rubbing together. What is the success of surgery? Generally, this is a safe and reliable operation to resolve pain and improve shoulder function although full recovery can take several months. What are the potential risks of surgery? Any surgical procedure carries risks, however every effort is made to minimise these to ensure the best possible outcome from your surgery. The risks of the operation include infection, bleeding, nerve damage and incomplete relief of symptoms. What is the recovery after surgery? You will have a sling to wear for comfort after the surgery that is usually discarded after the initial 2-3 days. You can safely use the shoulder within your comfort zone. Physiotherapy is essential after the operation, to encourage good movement, rehabilitate the muscles back to normal function and ensure you are making good progress. You will see a therapist prior to discharge from the hospital. You will be given painkillers to take home after surgery. The use of an ice pack on the shoulder may also be helpful for the first few days after surgery. You will be seen in clinic two weeks after surgery to check the wounds and assess your progress. There are no sutures to be removed. The pain will gradually settle and you will regain the movement in the shoulder over the next few weeks although it can take several months before you fully recover from the surgery. When can I return to normal activities? Return to work depends on the nature of the job and your speed of recovery. You can return to desk and computer work when you feel comfortable to do so but avoid any manual work, heavy lifting or sporting activities for 4-6 weeks. You may return to driving when you feel safe to control the vehicle, which is usually about 10-14 days after surgery. What is it? 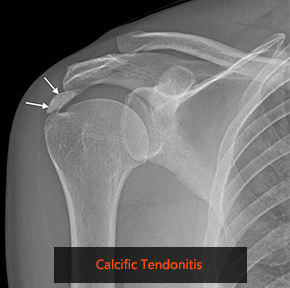 Calcific tendonitis occurs when, for no obvious reason, calcium deposits form within the rotator cuff tendons of your shoulder. The build up of pressure can lead to intense shoulder pain that is unbearable. The tissues (bursa) around the deposit also become inflamed. As with impingement syndrome, a bone spur and thickening of the ligament may develop over time causing narrowing of the space and further irritation of the tendon. What are the symptoms? The pain is typically felt over the shoulder and upper arm. The pain can come over a short period of time and may be very intense. It may be made worse by reaching away from the body or behind the back. It is common to feel pain at night making it difficult to sleep. Will I need any further investigations? An x-ray of your shoulder is needed as this may show the calcium deposit. More detailed scans such as ultrasound or MRI may be required to look at the soft tissues around the shoulder and locate the calcium. What are the non-surgical treatment options? Painkillers and anti-inflammatory medication may help reduce pain. Physiotherapy may help to strengthen the rotator cuff muscles and control symptoms. A steroid injection into the affected area can help reduce inflammation and pain, particularly if the attack is severe. What does surgery involve? Surgery (arthroscopic subacromial decompression and excision of the calcific depostits) may be necessary if other treatments fail. This is a keyhole (arthroscopic) procedure, performed under general anaesthetic. A local anaesthetic nerve block is usually given once you are asleep to provide pain relief after surgery. Two or three puncture wounds are made around the shoulder to allow insertion of arthroscopic instruments. 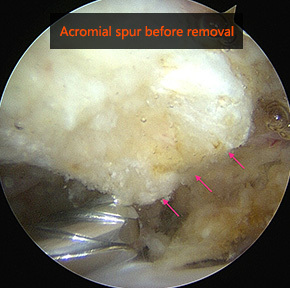 An arthroscope (camera) is inserted into the shoulder joint and a thorough inspection is performed to try and locate the calcium which can be released from the tendon and removed. Any inflamed bursa is removed and the space between the tendons and bone opened up by releasing the tight ligament from the bone and removing the bone spur. This allows the tissues to glide more freely and thus prevent the painful rubbing and inflammation. What is the success of surgery? Generally, this is a safe and reliable operation to relieve your symptoms. Overall the operation has a success rate (pain resolved and return of good movement and function) of 85-90%. What are the potential risks of surgery? Any surgical procedure carries risks, however every effort is made to minimise these to ensure the best possible outcome from your surgery. The risks of the operation include infection, bleeding, nerve damage, stiffness and incomplete relief of symptoms. What is it? Frozen shoulder is a condition in which the shoulder becomes painful and stiff due to inflammation and thickening of the lining around the shoulder joint. Usually this occurs spontaneously with no obvious cause. However it can be associated with a minor injury to the shoulder or after a period of immobilisation. Certain medical conditions such as diabetes predispose patients to developing frozen shoulder. What are the symptoms? 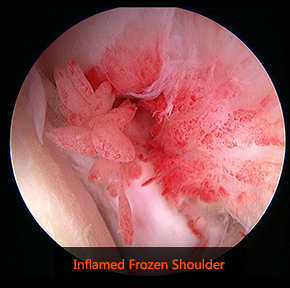 The predominant symptoms of frozen shoulder are pain and loss of motion. The pain, which is felt in the upper arm, can be relentless and severe at times. Pain is very common at night leading to loss of sleep. Shoulder stiffness makes it difficult to carry out many of the simple tasks of daily living. It is generally accepted that frozen shoulder will resolve on its own without specific treatment although this cycle may take several years. For this reason most patients choose to have treatment at an early stage. Will I need any further investigations? An x-ray of the shoulder is necessary to rule out other causes of a stiff and painful shoulder such as arthritis. More specialist tests are not usually required if the diagnosis is clear. What are the non-surgical treatment options? Painkillers and anti-inflammatory medication may help reduce pain. Physiotherapy may help to control symptoms. A steroid injection into the affected area can help reduce inflammation and pain. What does surgery involve? Surgery (arthroscopic capsular release) is considered if other treatments fail. This is a keyhole procedure, performed under general anaesthetic usually as a day case. A local anaesthetic nerve block is usually given once you are asleep to provide pain relief after surgery. Puncture wounds are made around the shoulder to allow insertion of a camera (arthroscope). A special instrument is used to release and remove the thick and inflamed lining of the shoulder joint. What is the success of surgery? Generally, this is a safe and reliable operation to resolve pain and improve shoulder movements with a success rate of about 90%. Introduction The ball (humeral head) of your upper arm bone fits into a shallow rounded socket in your shoulder blade (glenoid). The rotator cuff is a group of muscles, which attach closely around the shoulder joint. They function to keep the joint in the correct position and control shoulder movements. 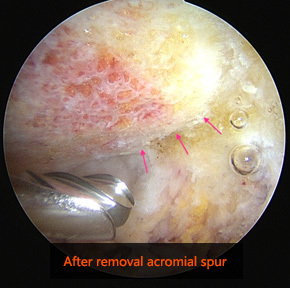 A typical total shoulder replacement replaces arthritic joint surfaces with a highly polished metal ball attached to a stem, and a plastic socket. A prerequisite for standard total shoulder replacement is that the rotator cuff tendons in the shoulder are intact and fully functional. When a joint replacement is required but there are significant concerns that the rotator cuff is torn or not functional then a reverse shoulder replacement is more appropriate. What is a reverse shoulder replacement? 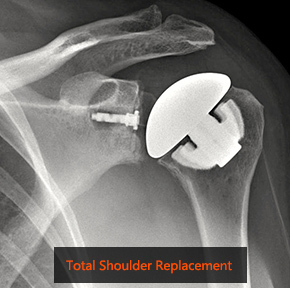 In reverse total shoulder replacement, the socket and metal ball are switched. That means a metal ball is attached to the shoulder bone and a plastic socket is attached to the upper arm bone. This is a stable articulation that holds the humerus centered (a previous function of the rotator cuff) and allows the deltoid muscle to lift the arm without the need for the rotator cuff. What is it used for? Originally reverse shoulder replacement was indicated only for patients with severe arthritis and completely torn rotator cuff (rotator cuff arthropathy). The use of this implant has now extended significantly to include people who have completely torn rotator cuffs (that can’t be repaired) with pain and severe arm weakness. Other indications include patients who have had a previous shoulder replacement that failed and in some severe fractures in older individuals that are beyond surgical repair. What does the surgery involve? The surgery is performed as an in-patient procedure and usually involves a hospital stay of 2-3 nights. This is performed under general anesthetic with a local anaesthetic nerve block provide postoperative pain relief. An incision is made over the front of the shoulder and head of the humerus is removed. A small plate is secured to the socket (glenoid) using a number of screws on top of which the metal ball is attached. A metal stem is inserted into the inside of the upper arm (humerus) on top of which is attached a plastic socket is inserted. The components are then linked together to allow smooth motion of the joint. What is the success of surgery? Generally, this is a safe and reliable operation to relieve your symptoms of pain and improve shoulder function. Due to the partially constrained nature of the prosthesis restoring range of motion is not quite as predictable as a standard total shoulder replacement. In particular there may be some restriction in rotation such as reaching behind your back. What are the potential risks of surgery? Any surgical procedure carries risks, however every effort is made to minimise these to ensure the best possible outcome from your surgery. The risks of the operation include infection, bleeding, nerve damage, stiffness, dislocation and fracture. Further risks with a shoulder replacement relate the artificial nature of the joint; although prosthesis designs and materials continue to advance, the prosthesis may wear down and the components may loosen. Excessive wear, loosening, or dislocation may require additional surgery (revision procedure). As this is a newer implant compared to a standard shoulder replacement, the long-term survival rates are not as well established. What is it? The rotator cuff is a group of muscles, which wrap closely around the shoulder joint. They function to keep the joint in the correct position and control shoulder and arm movements. The muscles attach from the shoulder blade to the top of the arm bone (humeral head) by the rotator cuff tendons. The tendons are prone to tear from the attachment on the bone through a long-term wear and tear process (chronic tear), after an accident or fall (acute tear) or a combination of both. Damage to one or more of these tendons can lead to shoulder and arm pain and weakness. What are the symptoms? The pain is typically felt over the shoulder and upper arm. It may be made worse by reaching away from the body or behind the back. It is common to feel pain at night making it difficult to sleep. Movements are usually weak and restricted making it difficult to raise the arm above shoulder height. Will I need any further investigations? An x-ray of your shoulder is helpful to exclude other causes of shoulder pain and assess for the presence of a bone spur that may contribute to the problem. 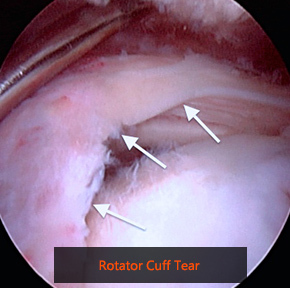 If suspected, a rotator cuff tear is best confirmed with either ultrasound or MRI scans. What are the non-surgical treatment options? Painkillers and anti-inflammatory medication may help reduce pain. Physiotherapy can sometimes be helpful in improving pain and weakness. A steroid injection into the affected area can help reduce inflammation and pain. It is important to be aware that a complete rotator cuff tear will not heal and the natural progression is that it will slowly get larger. What does surgery involve? 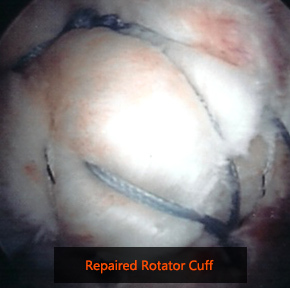 Surgery (arthroscopic rotator cuff repair) is reserved for patients that fail to improve with the above measures. If you have had an injury, then prompt surgical treatment is likely to result in the best outcome for your shoulder function. The aim of surgery is to repair the torn tendon back onto the bone to reduce pain and to restore shoulder function. 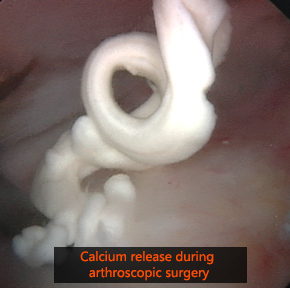 This is performed as a keyhole (arthroscopic) procedure, performed under general anaesthetic. A local anaesthetic nerve block is usually given once you are asleep to provide pain relief after surgery. Tiny puncture wounds are made around the shoulder to allow insertion of an arthroscope (camera) and instruments to repair the tendon. Specially designed small anchors are placed into the bone. The anchors have sutures attached that are passed through the torn tendon and tied to secure the tendon back onto the bone. Any inflamed tissue (bursa) and bone spurs are removed with shaving instruments. What is the success of surgery? Generally, this is a safe and reliable operation to relieve your symptoms. Overall the operation has a success rate (pain resolved and return of good movement and function) of 85-90 although it can be several months before you get the full benefit from surgery. What are the potential risks of surgery? Any surgical procedure carries risks, however every effort is made to minimise these to ensure the best possible outcome from your surgery. The risks of the operation include infection, bleeding, nerve damage, stiffness and incomplete relief of symptoms. Occasionally despite that the tendon has been repaired back to the bone, it fails to heal and re-tears. What is the recovery after surgery? The shoulder will be protected in a sling after the operation for a period of 6 weeks. During this time you begin a supervised rehabilitation programme under the guidance of a physiotherapist. It you have a very large tear repaired, then the rehabilitation is taken more slowly. After 6 weeks you can begin using your arm gently for daily activities which is gradually increased as pain allows. Heavy lifting should be avoided for 4-6months. Physiotherapy is essential after the operation, to encourage good movement, rehabilitate the muscles back to normal function and ensure you are making good progress. You will see a therapist prior to discharge from the hospital. You will be given painkillers to take home after surgery. The use of an ice pack on the shoulder may also be helpful for the first few days after surgery. You will be seen in clinic two weeks after surgery to check the wounds and assess your progress. There are no sutures to be removed. When can I return to normal activities? Return to work depends on the nature of the job and your speed of recovery. You can return to desk and computer work when you feel comfortable to do so. You will be unable to drive for at least 6 weeks until after the sling is removed. The timescale for which you can go back to any previous sport or activity will depend on your movement and strength and the particular activity you have in mind. What is it? Arthritis of the shoulder is a degenerative wear process of the smooth cartilage lining of the ball (humeral head) and socket (glenoid) joint. The worn surfaces can then rub on each other causing pain. 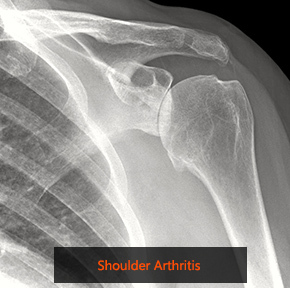 Arthritis of the shoulder is less common than arthritis affecting the hip or knee although the symptoms can be very disabling. What are the symptoms? The symptoms are of worsening deep-seated pain and stiffness which develop over months to years. Pain is made worse with activity and often felt at night making sleeping difficult. Loss of motion in joint may make it difficult to carry out simple activities of daily living. Will I need any further investigations X-rays are required to look for wear of the joint space and for the presence of bone spurs (osteophytes). CT scans allow for a more detailed assessment of the joint and are very useful when planning surgery. What are the non-surgical treatment options? Painkillers and anti-inflammatory medication may help reduce pain. It is sensible to modify or limit your activities with the arm to reduce the load on the shoulder. Cortisone injections into the shoulder joint may provide some temporary relief. What does surgery involve? Surgery (shoulder replacement) is reserved for patients that fail to improve with the above measures. The operation removes the arthritic joint surfaces and replaces them with artificial components. The typical total shoulder replacement involves replacing the arthritic joint surfaces with a highly polished metal ball attached to a stem, and a plastic socket. Sometimes it is not possible to replace the socket of the joint and in which case only the ball is replaced (hemiarthroplasty). Another type of shoulder replacement is called reverse total shoulder replacement. Reverse total shoulder replacement is used for people who have arthritis and non-functional rotator cuff. 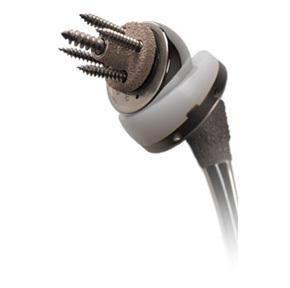 In reverse total shoulder replacement, the socket and metal ball are switched. That means a metal ball is attached to the shoulder bone and a plastic socket is attached to the upper arm bone. This allows the patient to use the deltoid muscle instead of the rotator cuff to lift the arm. 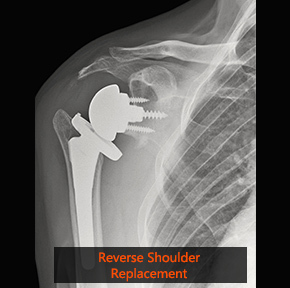 More information can be found in the reverse shoulder replacement section. What is the success of surgery? Generally, this is a reliable operation to relieve your symptoms of pain and improve shoulder function although there are a number of risks and complications. What are the potential risks of surgery? Any surgical procedure carries risks, however every effort is made to minimise these to ensure the best possible outcome from your surgery. The risks of the operation include infection, bleeding, nerve damage, stiffness and dislocation. Further risks with a shoulder replacement relate to the artificial nature of the joint; although prosthesis designs and materials continue to advance, the prosthesis may wear down and the components may loosen. Excessive wear, loosening, or dislocation may require additional surgery (revision procedure). What is the recovery after surgery? The shoulder will be protected in a sling after the operation for a period of 6 weeks. During this time you begin a supervised rehabilitation programme under the guidance of a physiotherapist. Physiotherapy is essential after the operation, to encourage good movement, rehabilitate the muscles back to normal function and ensure you are making good progress. You will see a therapist prior to discharge from the hospital. You will be given painkillers to take home after surgery. The use of an ice pack on the shoulder may also be helpful for the first few days after surgery. You will be seen in clinic two weeks after surgery to check the wounds and assess your progress. There are no sutures to be removed. When can I return to normal activities? Return to work depends on the nature of the job and your speed of recovery. You can return to desk and computer work when you feel comfortable to do so. You will be unable to drive for at least 6 weeks. The timescale for which you can go back to any previous sport or activity will depend on your movement and strength and the particular activity you have in mind. What is it? The bones of the shoulder joint consist of the head of the humerus (ball) and the glenoid (socket). The socket is in fact very shallow and therefore the joint is sometimes described as golf ball on a tee. There is a thick rim of tissue (labrum) attached to the edge of the socket that makes it deeper and provides stability to the joint. To provide more security, the joint is surrounded by soft tissues, which include the capsule lining the joint, ligaments, and the rotator cuff muscles. Despite all this, the shoulder is a ‘loose’ joint to allow great flexibility in movement. It is these factors that make the shoulder the most common joint to dislocate. The commonest cause of dislocation is an injury such as rugby or other contact sports. This may occur in anyone but is most frequently encountered in young adults. When the shoulder dislocates it tears part of the labrum away from the rim of the glenoid and also stretches the capsule of the joint. The labrum fails to heal in the correct position and the capsule remains slightly stretched leaving a weak point around the shoulder. What are the symptoms? 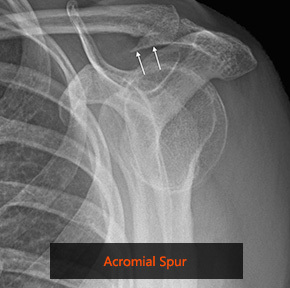 The shoulder may start to dislocate frequently requiring multiple attendances to hospital for relocation. Sometimes the shoulder only slips partially out of the socket (sublux) and it may be possible to reduce it into position yourself. There may be a feeling of insecurity and apprehension when the arm is in certain positions such as when the hand is raised above the head, for example while throwing. This may have an impact on your ability to return to certain sporting activities. Will I need any further investigations? 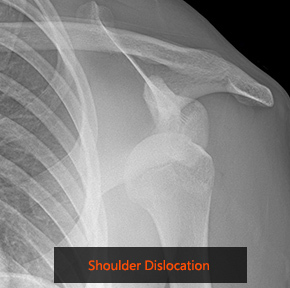 X-rays of the shoulder are helpful as these can sometimes show signs of damage that has occurred as the shoulder dislocated. More detailed tests such as CT or MRI scans may also be required. 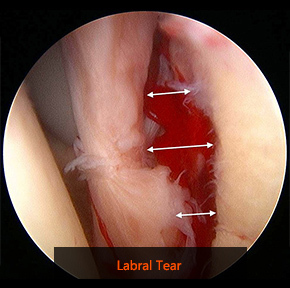 MRI scans are performed to show the extent of soft tissue (labral) damage and help with surgical planning. A dye may be injected into the joint (arthrogram) prior to the MRI scan to more accurately visualise and locate the tear. A CT scan is a better test to look at the bone structure of the joint in more detail and might be needed if there is a concern that there is significant underlying bone damage. What are the non-surgical treatment options? The emergency treatment is to relocate the shoulder into joint. Following a short period of rest in a sling, physiotherapy is helpful to regain mobility and strength of the shoulder. It is important to note however that physiotherapy cannot make the labrum heal in the correct position or tighten the capsule. What does surgery involve? Surgery (arthroscopic stabilisation) may be considered after the initial episode of dislocation (particularly in high level sports people) or if the shoulder repeatedly dislocates. Surgery is also used to treat patients whose shoulders feel unstable but that do not fully dislocate. 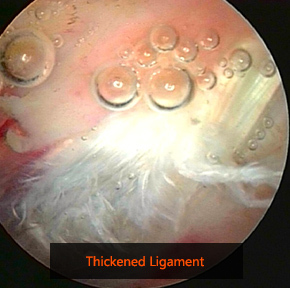 This is carried out using keyhole (arthroscopic) techniques and involves reattaching the ligaments and labrum to the socket. This is performed using specially designed small anchors placed into the edge of the socket. The anchors have sutures attached that are passed through the torn labrum and ligaments that are tied securely back to the socket. Sometimes the bone structure of the socket (glenoid) is significantly damaged in which case repairing the labrum on its own will not be effective. In this situation it may be necessary to transfer a piece of bone from the shoulder (the coracoid) and secure it with screws to the front of the glenoid to restore its surface (Latarjet procedure). What is the success of surgery? Generally, arthroscopic stabilisation surgery is a safe and reliable operation to make the shoulder feel secure and reduce the chance of the shoulder dislocating again. There is however a reported 10% risk that a further dislocation episode occurs. What are the potential risks of surgery? Any surgical procedure carries risks, however every effort is made to minimise these to ensure the best possible outcome from your surgery. The risks of the operation include infection, bleeding and nerve damage. The shoulder can occasionally get stiff after surgery but this will usually loosen with physiotherapy and time. The Latarjet procedure is a more complex operation and has added risks including failure of the bone to heal to the glenoid. What is the recovery after surgery? The shoulder will be protected in a sling after the operation for a period of 4-6 weeks. During this time you begin a supervised rehabilitation programme under the guidance of a physiotherapist. Physiotherapy is essential after the operation, to encourage good movement, rehabilitate the muscles back to normal function and ensure you are making good progress. You will see a therapist prior to discharge from the hospital. You will be given painkillers to take home after surgery. The use of an ice pack on the shoulder may also be helpful for the first few days after surgery. You will be seen in clinic two weeks after surgery to check the wounds and assess your progress. There are no sutures to be removed. When can I return to normal activities? Return to work depends on the nature of the job and your speed of recovery. You can return to desk and computer work when you feel comfortable to do so. You will be unable to drive for 6 weeks until after the sling is removed. The timescale for which you can go back to any previous sport or activity will depend on your movement and strength and the particular activity you have in mind. Examples include cycling ten to 12 weeks, gentle swimming ten to 12 weeks, light racket sports using operated arm 16 weeks, contact sports four to six months. What is it? Injuries and fractures around the shoulder are caused by a fall onto an outstretched arm or a direct impact to the shoulder. The most common fractures are of the collar bone (clavicle) and the upper part of the arm bone (proximal humerus). What are the symptoms? Immediate pain is felt around the fracture site and the area may swell, bruise and appear deformed. Will I need any further investigations? X-rays are required to confirm the presence of a fracture, its location and severity. The pattern of fracture seen on the x-rays will determine the treatment. In addition to the x-rays, a CT scan may be required to further assess the fracture configuration that may help in decision making for treatment. What are the non-surgical treatment options? Provided that the bones have not moved significantly out of position, then it is likely that you will be treated with pain medication and given a sling to initially rest the fractured bone. Gentle shoulder motion will usually be commenced a few weeks after the injury. What does surgery involve? In the situation that the bones have moved significantly out of position, then surgery may be necessary to realign the position of the bones and secure them in place with screws and plates. This should allow you to commence shoulder motion shortly after surgery to minimise stiffness. What is the success of surgery? The aim of surgery is to regain functional range of motion and strength. Most patients that have had surgery for a clavicle fracture regain full shoulder motion and function relatively quickly. 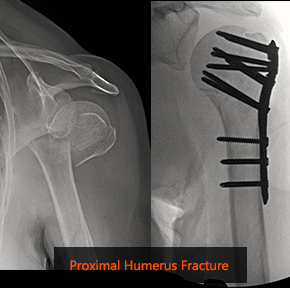 Outcomes for surgery on proximal humerus fractures are less predictable and it is likely that some range of motion may be lost. Recovery can take several months depending on the nature of the injury and complexity of the surgery. What are the potential risks of surgery? Any surgical procedure carries risks, however every effort is made to minimise these to ensure the best possible outcome from your surgery. The commonest risks of surgery include infection, nerve or blood vessel damage. As with any fracture in the body, there is a chance that bones fail to heal. 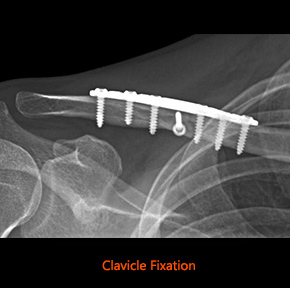 Occasionally the implants that are used to reconstruct the fracture cause problems and need to be removed at a later date; this is particularly the case for clavicle fractures as the bone has little soft tissue coverage. What is the recovery after surgery? There will be an adhesive dressing over the wound, which can usually be left undisturbed until your follow-up appointment at around 2 weeks. Rehabilitation after surgery will vary individually depending on the type and complexity of injury. This will be discussed on an individual basis following surgery. When can I return to normal activities? The advice will vary individually depending on the type and complexity of injury and whether surgery was needed. What is it? 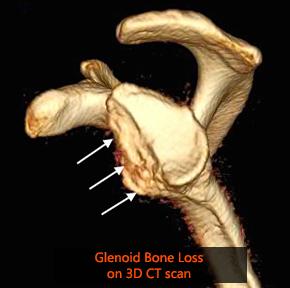 The socket of the shoulder (glenoid) has a cartilage rim that lines the periphery of the glenoid, called the labrum. This structure is important in shoulder stability. The upper cartilage rim (superior labrum) is where the biceps tendon attaches. 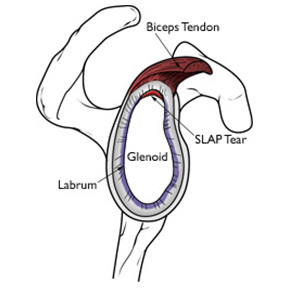 Injury to the superior labrum is called a SLAP tear, which stands for Superior Labrum, Anterior to Posterior (front to back). The injury usually occurs after a fall on an outstretched hand, a direct blow on the shoulder or because of repetitive overhead activity, such as throwing sports. What are the symptoms? The usual symptom is of shoulder pain, especially after overhead activity or on loading the shoulder such as during gym work. The pain is felt deep within the shoulder and some patients may feel a painful click with certain shoulder movements. Will I need any further investigations? X-rays of the shoulder are helpful to exclude other causes of shoulder pain. 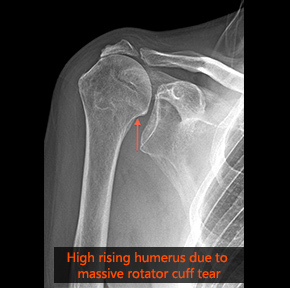 An MRI arthrogram is the best way to detect a potential SLAP tear. This involves having a dye injected into the shoulder joint prior to the MRI scan. What are the non-surgical treatment options? Treatment with physiotherapy can be attempted, but most symptomatic SLAP tears fail to settle and require surgery. What does surgery involve? 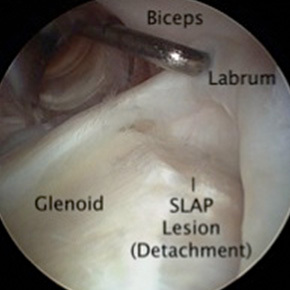 Surgery (arthroscopic SLAP repair) is carried out using keyhole (arthroscopic) techniques and involves reattaching the upper part of the labrum to the bone. This is performed using specially designed small anchors placed into the edge of the socket. The anchors have sutures attached that are passed through the torn labrum that are tied securely back to the socket. What is the success of surgery? Generally, arthroscopic SLAP repair is a safe and reliable operation to resolve pain and restore normal shoulder function. What are the potential risks of surgery? Any surgical procedure carries risks, however every effort is made to minimise these to ensure the best possible outcome from your surgery. The risks of the operation include infection, bleeding, nerve damage and failure to heal. The shoulder can occasionally get stiff after surgery but this will usually loosen with physiotherapy and time. What is the recovery after surgery? The shoulder will be protected in a sling after the operation for a period of 4-6 weeks. During this time you begin a supervised rehabilitation program under the guidance of a physiotherapist. Physiotherapy is essential after the operation, to encourage good movement, rehabilitate the muscles back to normal function and ensure you are making good progress. You will see a therapist prior to discharge from the hospital. You will be given painkillers to take home after surgery. The use of an ice pack on the shoulder may also be helpful for the first few days after surgery. You will be seen in clinic two weeks after surgery to check the wounds and assess your progress. There are no sutures to be removed. What is it? The rotator cuff is a group of muscles, which wrap closely around the shoulder joint. They function to keep the joint in the correct position and control shoulder and arm movements. The muscles attach from the shoulder blade to the top of the arm bone by the rotator cuff tendons. The tendon runs beneath a space made up of bone and a ligament. A bone spur and thickening of the ligament may develop over time causing narrowing of the space and rubbing of the tendon. A thin layer of tissue (bursa) that covers the tendon and normally helps with smooth gliding gets secondarily thickened and inflamed resulting in pain. What are the symptoms? The pain is typically felt over the shoulder and upper arm. It may be made worse by reaching away from the body or behind the back. It is common to feel pain at night making it difficult to sleep. Will I need any further investigations? An x-ray of your shoulder is helpful to exclude other causes of shoulder pain and assess for the presence of a bone spur that may contribute to the problem. More detailed scans such as ultrasound or MRI may be required to look at the soft tissues around the shoulder. In particular it is important to know if there is an underlying damage (tear) of the rotator cuff tendons. What are the non-surgical treatment options? Painkillers and anti-inflammatory medication may help reduce pain. Physiotherapy may help to strengthen the rotator cuff muscles and control symptoms. A steroid injection into the affected area can help reduce inflammation and pain. What does surgery involve? 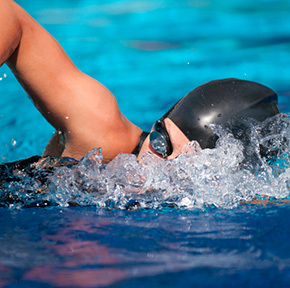 Surgery (subacromial decompression) may be necessary if other treatments fail. This is a keyhole (arthroscopic) procedure, performed under general anaesthetic usually as a day case. A local anaesthetic nerve block is usually given once you are asleep to provide pain relief after surgery. Two or three puncture wounds are made around the shoulder to allow insertion of arthroscopic instruments. An arthroscope (camera) is inserted into the shoulder joint and a thorough inspection performed to detect any other possible causes of symptoms. The arthroscope is then inserted above the rotator cuff tendons to visualise the inflamed bursa that is removed with an instrument through a keyhole from the side of the shoulder. The tight ligament is then released from the bone and a small burr is used to remove the bone spur. This allows the tissues to glide more freely and thus prevent the painful rubbing and inflammation.